From left, Daniela Schadt, with Mary and James Droney, President of the Federal Republic of Germany Joachim Gauck and Minister of Agriculture, Food and the Marine, Tom Hayes, on the Droney's farm in Ballyvaughan. Photograph by Maxwell's. THE President of the Federal Republic of Germany, Joachim Gauck, was in “God’s wide fields” in Ballyvaughan for the first of a two-stage visit to Clare this week. Mr Gauck, accompanied by his partner Ms Daniela Schadt, was delighted to be visiting the Droney’s 90 hectare Origin Green farm in Ballycahill, near Ballyvaughan and to be surrounded by 200 beef suckler cows and 200 sheep, a vista, he admitted, that brought him back to his childhood in post-war Germany. “For me, it is so good,” Mr Gauck told The Clare Champion. “In my youth, I saw so many cows outside and now, if I go back to my home area in the north of Germany, no cows are outside, sheep are a little bit but the cows are all inside in a shed. The German President had started the day, the final of his three-day State visit, at NUI Galway where he was conferred with an Honorary Doctorate. “This morning, I was in a different situation in the University of Galway where they honoured me with an Honorary Doctorate and, now, I’m here in God’s wide fields and it’s wonderful. I’ll be back again but not as the president,” he said. The State visit began on Monday afternoon with a formal welcome ceremony at Áras an Uachtaráin. On Tuesday, President Gauck visited Leinster House and German software company SAP, before a visit to view the Book of Kells in Trinity College and a reception at Farmleigh House, where James Breen, Cathaoirleach of Clare County Council, was among the guests. 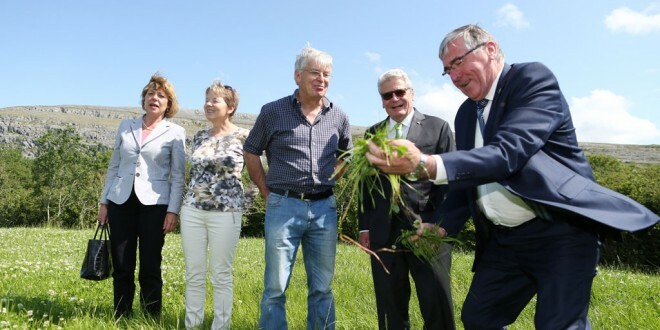 Following their arrival in Ballyvaughan, President Gauck and Ms Schadt walked the farm accompanied by James and Mary Droney and by Tom Hayes, Minister of State at the Department of Agriculture, Food and the Marine. James Droney, a son of legendary traditional musician Chris, outlined Bord Bia’s Origin Green programme and how Ireland aims to be a world leader in producing food sustainably. He also explained to his guests what it means for him to be a member of Bord Bia’s Beef and Lamb Quality Assurance Scheme, while farming in the unique environment of the Burren. Speaking on the farm, Minister Hayes noted, “Germany is a very important market for our agri-food sector and the Origin Green Programme is a watermark for Ireland’s sustainable food production systems. It builds on our rigorous programme of food safety and traceability measures that allow us to trace from farm to fork. I am delighted the President and Ms Schadt have come to a family farm in Ireland to see how high quality beef can be produced in an environmentally sustainable way”. Mr Droney farms almost 90 hectares of mostly free-draining grassland, along with some upland pasture. He keeps 55 beef suckler cows, mainly Charlois, Limousin and Blonds d’Aquitaine and rears 50 young cattle to beef, in addition to the 150 lambs that he rears during the summer months. Mr Droney’s farm is registered with Bord Bia’s Beef and Lamb Quality Assurance Scheme and achieved an excellent score in a recent carbon footprint survey as part of the Origin Green sustainability programme for Irish food. The German visitors were also introduced to Dr Brendan Dunford of the Burren Beo Project, who explained the farming practices in the area over the past 6,000 years. “I think that’s a very important point to make as well,” added Minister Hayes. “It maintains rural areas, which is good,” he said. President Gauck thanked his hosts and said, “It was an impressive encounter, thank you so much,” while his partner Ms Schadt told Mary Droney she was sorry they had to leave and added, “We would like to stay longer”.